In addition to providing CAMP members with information about state and federal legislative and regulatory developments related to the industry, CAMP advocates for members at the state, federal and executive levels. CAMP's advocacy activities are lead by the Government Affairs Committee Chair and supported by Chapter Government Affairs Chairs through the state. All CAMP members are encouraged to participate in advocacy at the local, state, federal and executive levels. The CAMP Board of Directors has decided to take the following position in regards to BRAWL. We support NAMB and its mission statement. The Board of Directors values our relationship with NAMB and will continue to support and build that relationship to be mutually beneficial for CAMP and NAMB and our members. CAMP will not comment on or engage in conversations about BRAWL – it would be unproductive for us to take a side or participate in this debate. CAMP is an Affiliate of NAMB, but CAMP is an independent association – NAMB’s views or positions on any subject do not necessarily reflect the views of CAMP or its members. CAMP represents all mortgage loan professionals in the State of California and we will not favor one channel over another. CAMP supports healthy and fair competition because strong competition leads to better customer service and better pricing for consumers. CAMP opposes unfair or unethical business practices that harm, or have the potential to harm, consumers or stifle competition. CAMP will continue to focus its energy on educating loan originators and providing them with the tools and information to be successful and grow their businesses. 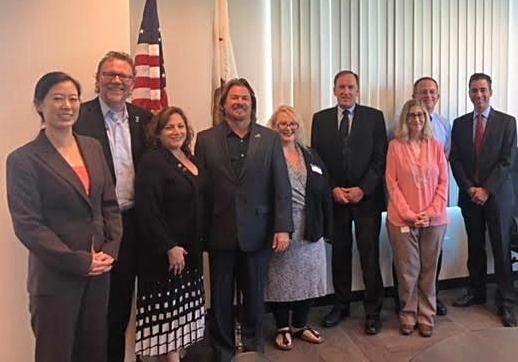 CAMP Leaders represent the mortgage professional community in California while visiting Representative Brad Sherman to discuss federal legislation. Protect our industry and grow CAMP's political influence by contributing to CAMP's State and/or Federal PAC. Visit the CAMP PAC Webpage HERE. Latest news from the Dept of Real Estate. CAMP worked hard on behalf of members to get clarification from the CA Bureau of Real Estate around how TRID impacts MLDS requirements. The BRE issued a statement on Mortgage Loan Disclosure Statement, which you can read here. The bottom line from the BRE: under TRID, the "Loan Estimate" replaces the MLDS and as long as it is signed by the borrower, it meets the requirements of law. Have questions? Contact the BRE: (916) 263-8941. Want some tips on how to approach Congressional Staff? Read a great article HERE. Need help scheduling a meeting? Contact Meggan Jackson, at meggan.jackson@namb.org.